Now that spring has sprung, Tewkesbury Borough Council is asking dog owners to join the dog walking community in bagging and binning dog poo. A new Public Space Protection Order has been introduced which now gives council officers more powers to tackle dog fouling across Tewkesbury Borough. As part of the order, dog walkers can not only be fined £100 for not picking up after their dogs, but can now also get a £100 fixed penalty notice for not carrying dog poo bags. The council is aware that most people are picking up after their pets but, sadly, the small few who don’t are continuing to risk the health of others. Dog faeces carries the risk of disease, particularly Toxacariasis – an infection caused by roundworm parasites. As a result, environmental health officers will be working with parish councils to spread awareness of the new Public Space Protection Order across Tewkesbury Borough. Old signs will be replaced with new ones, and patrols will be carried out regularly at dog fouling hot spots. Dog fouling can be reported to the council through their website here. 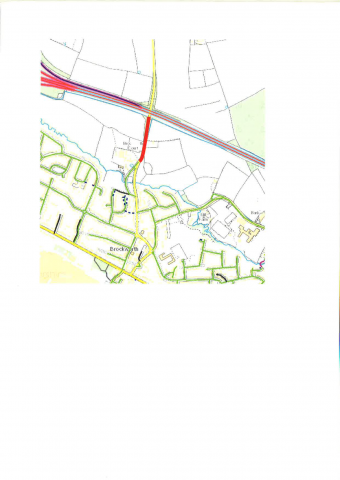 Brockworth Lane will be closed from 09/05/19 – 14/10/19 to allow for the safe construction of footways and a roundabout. As local elections approach, Tewkesbury Borough Council is urging residents to make sure they are registered to vote. Residents have until Friday 12 April 2019 to register to ensure they are able to vote in the borough and parish elections on Thursday, 2 May 2019. All that’s needed is a National Insurance number and just five minutes of time to visit here. In the event that a registered elector is away or cannot go to their polling station on 2 May 2019 then they can either apply to vote by post or apply to vote by proxy (nominate someone to vote on their behalf) – simply visit yourvotematters.co.uk to download the relevant application form. The borough council would also like to encourage those who are passionate about their local community to consider standing as a councillor. Elections for Tewkesbury Borough Council take place every four years, with 38 councillors elected across 20 wards. • Nominations for candidates are open and we will be receiving nominations right up until 4pm on Wednesday 3 April 2019. The council will publish its Statements of Persons Nominated by 4pm on Thursday 4 April 2019. Highways England continue to make good progress on the A417 Missing Link and hope to announce their preferred route in the spring. You can read more about what they’ve been up to in their latest newsletter, click here. The Community Engagement Vehicle will be outside Tesco (Brockworth) on Wednesday 16th January 2019. If you are in the area please come and visit and speak to the officers about crime prevention or please feel free to say hello. The next Parish Council meeting will be held on Monday 14th January 2019 (please note revised date) at the Pineholt Village Hall starting at 6.30 p.m.
All residents of the parish are welcome to attend. Sign up today for local news and alerts in your community. By registering today you will receive news and appeals, local crime information and crime prevention advice – directly to you. It will also help your local policing teams better police your neighbourhood, for further details and to register click here.